- Display: 3½ digit liquid crystal display (LCD) with maximum reading of 1999. - Temperature monitor from far distance. Dimensions: 770(H) x 65.5(W) x 35mm(D). We are one of the widely recognized companies involved in offering Digital Hygro Thermometer. Digital Hygro Thermometer. These are highly reckoned among our patrons due to their high durability. Moreover, these Digital Hygro Thermometers are provided with LD display and are offered to our customers at very feasible rates. 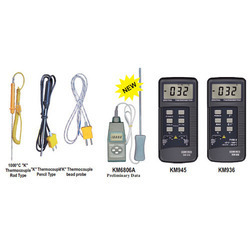 Our organization is well known in the market for providing a broad assortment of KM936 Kusam Meco Digital Thermometer to our clients. These products are manufactured using quality tested components. - Backlight ON / OFF Selection. - °C / °F Selection.